Natural resource engineering is the design of planned activities that compliment or oppose natural or societal forces and leads to modifications in soils, water, biota and/or the air. Natural resource engineers prevent and solve problems stemming from manipulation of the elements native to the earth. This book integrates environmental and water quality issues. It surveys hydrology in general with focus on surface water management. Topics covered include water quality, erosion, open channel flow, structures, embankments, irrigation and drainage, wind erosion and odours. Ernest W. Tollner is professor of Biological and Agricultural Engineering at the University of Georgia, Athens. His teaching and research interests include management of runoff and nonpoint source pollution in agriculture and urban settings. Chapter 1. Natural Resources Engineering Opportunities. Chapter 6. Erosion by Water. Chapter 7. Water Quality and Upland Nonpoint Pollution. Chapter 8. Open Channel Hydraulics. Chapter 10. Terraces and Diversions. Chapter 11. Hydraulics of Water Management Structures. Chapter 12. Impoundments and Embankments. Chapter 13. Shallow Groundwater Management with Drains and Wells. Chapter 14. Introduction to Irrigation Design. Chapter 15. Streamflow Processes and Lake Dynamics. Appendix A: Ethics, Biotic Relationships, and Resource Economics. Appendix B: Solutions for Trapezoidal Channels with Constrained Velocity. 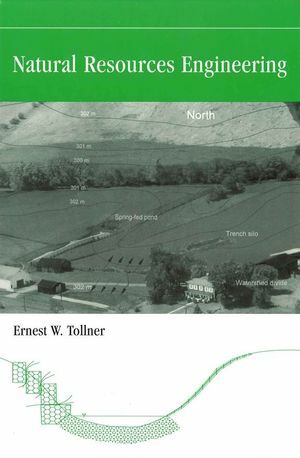 Appendix C: Structure Installation and Soil-Imposed Forces. Appendix D: Land-Forming Computations for Surface Drainage. Appendix E: Centrifugal Pumps and Pumping System Design. Appendix F: Plant Water Potential.